EU leaders, who are exasperated by Britain’s Brexit melodrama, said they would only grant the extension if May could win Parliament’s approval for her twice-rejected Brexit deal. Otherwise, the U.K. is facing a much longer delay to Brexit, or a chaotic “no-deal” departure from the bloc. British opposition politicians, and pro-EU members of May’s Conservative government, had urged a longer extension, saying a delay of just a few months could leave the country once again facing a chaotic “no-deal” Brexit this summer. Withdrawing without a deal could mean huge disruptions for businesses and U.K. residents, as well as those in the 27 remaining EU countries. 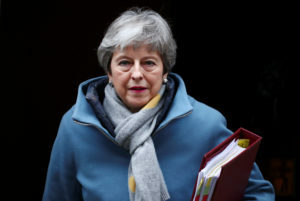 “As prime minister I am not prepared to delay Brexit any further than June 30,” she told the House of Commons — a hint she could quit if Britain is forced to accept a longer delay. EU leaders are unlikely to agree to a delay until Parliament has voted again on May’s deal. “As long as we don’t know what Britain could say yes to, we can’t reach a decision,” European Commission chief Jean-Claude Juncker told Germany’s Deutschlandfunk radio. Cook reported from Brussels. Raf Casert in Brussels, Samuel Petrequin in Paris, Danica Kirka in London and Geir Moulson in Berlin contributed.